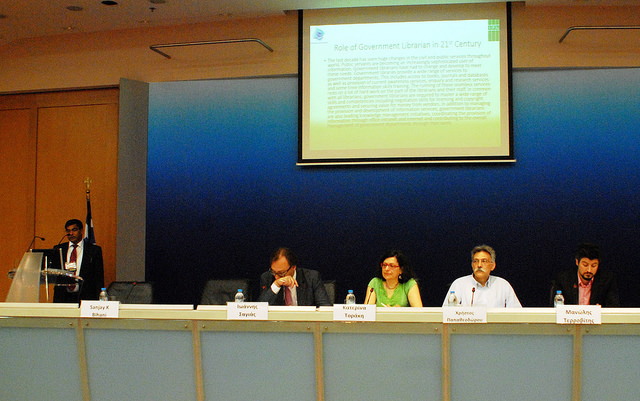 The Secretariat General of Information & Communication (SGIC) represented by the Library of the Analysis and Documentation Directorate, in collaboration with the Hellenic Competition Commission, organised a full-day event themed “Government Information and Libraries: production – management – access”. The main goal of the event, which was included in the parallel events of the Hellenic Presidency of the Council of the European Union, was to present the main aspects of government information life circle with regards to strengthen current actions on open access to government information. Along with this, one of the main concerns was to motivate the field of government libraries towards empowering their role in this context. The event addressed members of Greek public administration who produce, manage or need access to government information, as well as librarians – information professionals and any other interested party. Given the specific field of interest and the fact that government libraries are hardly known to the Greek community, there are some encouraging facts about the event. More than 110 delegates from more than 45 agencies, mostly from the public sector, attended the event. Academic and research communities were also represented as well as the private sector. The keynote speech of the event was delivered by Sanjay Kumar Bihani, Chair of IFLA’s Government Libraries Section. Some of the main points of his speech comprised the role of government libraries concerning the dissemination of government information as well as the role of professional bodies with regards to keeping up to date with new developments of the field. Other important points were about open data and open access to government information along with the role of government libraries and government librarians. It was particularly stressed that government librarians ought to adjust to the new environment of managing information in the context of the semantic web by receiving appropriate training. Finally, Mr Bihani honored us by announcing to the delegates the release of the Greek translation of IFLA’s “Guidelines for Libraries of Government Departments” by Maria Monopoli, librarian at the Bank of Greece, and Anna Mastora, librarian at the Secretariat General of Mass Media – Secretariat General of Information & Communication. The Greek translation is expected to play a key role among Greek government libraries. During the four thematic sessions of the event, speakers elaborated on issues regarding the production and management of government information. Additionally, represented government agencies discussed current implementations along with the need to achieve interoperability for public administrations. What was given particular emphasis was the need for collaboration among agencies especially towards potential funding for public sector organisations from the European Commission programme “HORIZON 2020”. Finally, a Round Table took place, the interdisciplinary synthesis of which allowed for a multifaceted review of the event. One of the main points was the identified necessity for information professionals and libraries to undertake an emerging role in the process of producing, managing and accessing government information. Moreover, an important part of the discussion was occupied by copyright issues and the libraries’ commitment to them, along with issues related to identifying and meeting the needs of government libraries’ users. Concluding this report, we may say that it is already evident that the goal of the event has been achieved. Greek government libraries seem now to have more motivation for extroversion, communication with others and the development of synergies in many levels. This was the first time that Greek government libraries raised their voice in such a collective way so that they made their presence noticeable by both the libraries’ community and the public administration stakeholders. More information about the event is available in English and Greek.